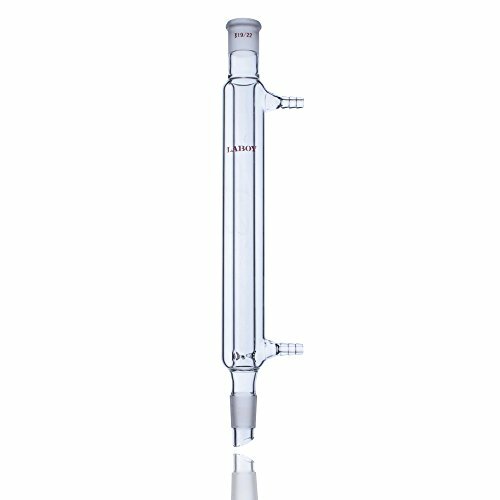 This jacked distillation condenser with 8mm hose connection accommodating 6mm I.D Rubber tubing for water in and out. With indentations at bottom to support packing material. With 19/22 top outer and bottom inner glass joint. The jacket Length is 200mm, and the overall Length is 280mm. Laboy glass are all made of high-quality borosilicate glass and made by hand-blowing to ensure uniform wall thickness. If you have any questions about this product by LABOY, contact us by completing and submitting the form below. If you are looking for a specif part number, please include it with your message.